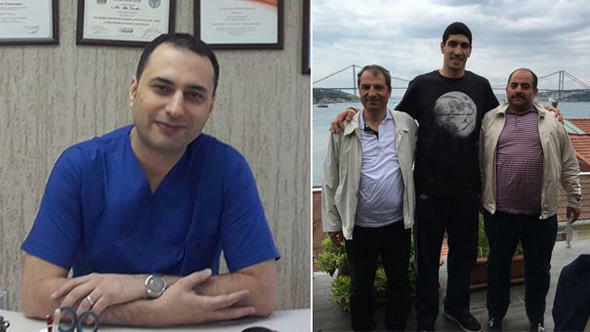 Dentist, identified as A.I.B., has been sentenced to 7.5 years of prison sentence nearly one and a half year after he was detained over NBA player Enes Kanter’s picture taken at the balcony of Istanbul clinic. A.I.B. was first jailed pending trial in October 2016 when he was reported to police as the owner of a dental clinic where Kanter took a picture of himself along with former prosecutors Zekeriya Oz and Celal Kara, and the picture went viral on social media back then. Kanter, Kara and Oz face outstanding arrest warrants over their ties to the Gulen movement. Turkish government blames the movement for the July 15, 2016 failed coup and calls it a terror group while the latter denies involvement and any terror-related activities. During his final hearing on March 29, the dentist said the trio was his former patients. The court overseeing his case convicted him on charges of membership to a terror group and sentenced to 7.5 years in prison. A.I.B. was released from prison only to house arrest. His wife E.K.B., also a dentist at the same dental office, faces 15 years in prison over similar charges in a separate investigation. More than 160,000 people have lost their jobs and 60,000 were remanded in prison pending trial over Gulen links since the summer of 2016.